When the Drum Corps International World Championships returned to Foxboro, Mass. 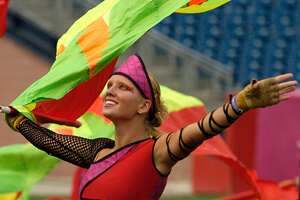 in 2005, gone was Foxboro Stadium, the venue in which DCI visited in 1994. In what had been its parking lot, a much larger Gillette Stadium had risen. Among the movers and shakers outside of the 12 finalist corps, the Colts switched places with the Crossmen while capturing 13th in the Semifinals. Crossmen, a finalist every year between 1989 and 2004, slipped out of the top 12 and wouldn't regain a finalist berth until 2012. Capital Regiment brought out a gigantic sundial that dominated the field and 16th place Southwind bounced back into the Semifinals after sitting on the outside for the previous three years. In the Quarterfinals, Mandarins and Seattle Cascades tied for 17th place, so both corps advanced into what normally would be a 17-corps contest, where amazingly, both corps once again received the same score. Sitting under Pacific Crest and Esperanza, the Magic returned after a challenging restructuring, topping Troopers, Pioneer and Kiwanis Kavaliers. The repertoire for Southwind's "A Distorted Imagination" read like a laundry list. All but Gustav Holst's "Mars" from "The Planets" originated with movie soundtracks. Other selections included "Song of Bethlehem" from "Ben Hur" by Erich Kloss, "Pure Imagination" from "Willy Wonka and the Chocolate Factory" by Anthony Newley and Leslie Bricusse, "The Battle" from "Gladiator" by Hans Zimmer and Lisa Gerrard, "Blue Shadows and Purple Hills" from "Spartacus" by Alex North, "Main Title" from "The Wind and the Lion" by Jerry Goldsmith, "Incantation" from Cirque du Soliel's "Quidam" by Benoit Jutras, "A Mother's Love" from "Ben Hur" by Carlo Savina, "Bacchanale" from "Sampson and Delilah" by Camille Saint-Sa?«ns, "Reunited" from "Van Helsing" by Alan Silvestri, and "The Horseman" and "Raisuli Attacks" also from "The Wind and the Lion." One needs only to look at the extensive repertoire list to realize the show was far from the norm. The show was a constantly evolving musical-visual sculpture of the mind. Musical snippets floated in and out of one's consciousness like a dream wandering into uncharted subconscious territory. Some of the musical selections listed above were hidden to such an extent that many fans probably weren't even aware of their existence in the show. The music and accompanying drill formations often subtly shifted, merging in and out of consciousness in a quiet progression of sound and color, followed by kaleidoscopic melodies and forward maneuvers that bubbled to the surface in a frenetic maelstrom. To appreciate the show, you had to free your mind to wander and even daydream. Designing this show must have been like walking into a paint store and creating a custom can of pigments. Sometimes the different pigments blended together, and other times the individual components burst out of the can on the brilliantly colored flags and the jester-like guard costumes to draw the attention away from the next can of paint being mixed. Overall, the show had a sort of Middle Eastern flavor with some recurring motifs that were sewn into the fabric of the production. The chant section—of which the first part is seen at the end of the accompanying video clip—was perhaps the most memorable part of the show, possibly because of the contrast in how it took so much time to develop while some other themes snuck in to say "hi" and then just as quickly left. Throughout the entire production, one was always aware that the show was supposed to project a sense of being somewhat off-kilter. But by the end, when the dreamscape was over and it was time to get back to reality, everything looked positively normal. 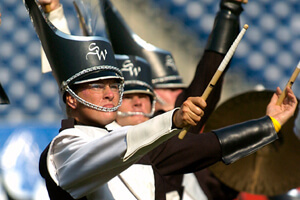 For this week only, you can save on the DVD that contains this complete Southwind performance, along with all of the 13th through 24th placing corps at the 2005 DCI World Championships. Buy the 2005 Division I Volume II World Championship DVD. (Available this week only for 20% off. Regular price: $29.95.) Discount DVD offer ends Monday, March 25 at 8:30 a.m. ET.